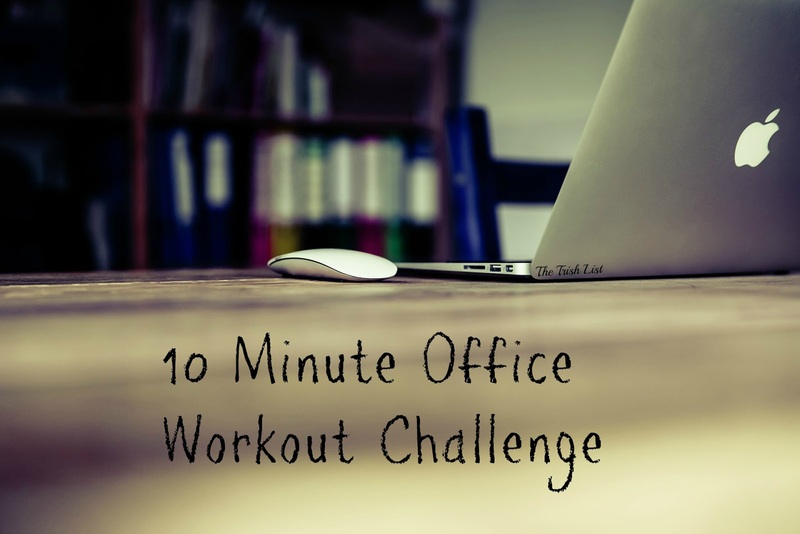 There has been a lot of response to the 10 minute challenges I have been doing at work so I decided to put together a 10 minute office workout that you can do quick and easily at the office. This has helped me break up my day when I've been sitting a lot. Thankfully most days for me includes lots of running around, but I do get those days where I need stretch my legs and get my heart pumping. All you need for this challenge is a timer, sneakers, and non-restrictive clothing. 2 Minutes: Warm up. I suggest taking a brisk walk around your office or doing jumping jacks at your desk. This will get your muscles warmed up so you do not hurt yourself. 2 Minutes: Do 3 sets of 15: squats. Rest for 30 seconds between each set. 2 Minutes: Do 2 30 second planks with 30 second rests between each. 2 Minutes: Do 2 30 second sets of tricep dips. 30 second rests between each. 2 Minutes: Finish up with jumping jax. Make sure to stretch it out at the end if you are feeling any tightness or soreness. Always go at your own speed. If something does not feel right, then stop and modify it to make it comfortable. Drink plenty of water through the day to stay hydrated. *Remember to always consult your doctor when starting a new workout practice. I am not a doctor nor am I a certified trainer. These are exercises I do daily at my own leisure. So what did you all think? Easy enough right? Would you want to see more of these? Lemme know in the comments below :) Happy Monday! This is great! I love quick and easy workouts! This is a great idea! I sit all day and I am so bad about forgetting to get up and move around! I so need this! I find myself doing laps around the library to get moving! Its so quick and easy but man does it pack a punch! Totally! I love doing these quick things but they sure to get those muscles sore! I started doing this and now I am itching to get up and move! Hope it helps you! I am still jealous that you work in a library! But this will def get your heart pumping!